Written by Forest Pines; published at 2:06 pm on November 10th, 2008. A few weeks ago, exploring the local area, we started walking up the Ashton-Pill path. It runs along the side of the railway up the south bank of the Avon, along the Avon Gorge and under the famous Suspension Bridge, downriver towards Pill. * We walked along it until we got bored and turned around. ** En-route, though, we saw something slightly unusual. A big pile of plastic bottles, on the shore, below the path but above the tide line, corralled together. Presumably, we thought, some sort of anti-littering campaign, fishing non-degradable bottles out of the river or out of the undergrowth. But then, the other day, we were up on the Downs on the far bank, and noticed the bottles—or, what we assume is those bottles—again. They’ve been arranged into words. We have no idea, though, what it is. An art project? An advertising slogan? An anti-littering project as we originally thought? The internet doesn’t seem to be helping – the only relevant search hit at the moment is, er, that photo. We’re puzzled. UPDATE: Thank you to a correspondant called Liz – who was also puzzled by it – for letting me know what it is. It is, indeed, an anti-littering art project; there are apparently 1000 plastic bottles washed up on every tide,*** hence the text. It does, though, change regularly, and eventually the artist, whose name is Pete Dolby, is going to make them all into a raft. So now we know. ** after all, walking down towards Pill and back another way would have been a very long walk; and any other circular routes would have involved a stiff climb through the woods. 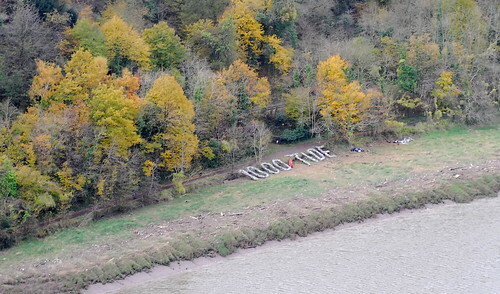 *** in the Avon Gorge, that is. I’m not sure what the number per mile of coastline is.